A wedding is a special event that you’ll remember for years to come, but it takes a lot of effort to overshadow it with just your wedding cars! For every reasonable, fancy car, there’s something more downright insane waiting just around the corner that you could turn into a bizarre – yet memorable – choice of transport. Wedding transport is just one of the many facets of organising the perfect wedding and it’s one that, when done right, can leave a lasting impression not just on the bride and groom, but also their esteemed guests. Arriving to the ceremony in style will strike a real chord with everyone present and set the tone perfectly for the biggest day of your life. Every wedding day should be fit for a princess, so what could be better than the fairytale dream of princess ball gowns, rose petals and the traditional horse and carriage for your wedding transport? The image of the perfect wedding can mean different things to different people, but it can be hard to shake off that expectation of a big white wedding. However, gone are the days when every bride must resemble a meringue-based dessert and say “I do” in the family church. Nowadays, the most important thing to a 21st-century bride is to make sure her big day is 100% unique. One major decision that will be made in the planning of your wedding day will be your mode of transport. After all, you want the moment you arrive and leave the ceremony to be unforgettable. If you don’t know where to start or don’t know that much about cars and just need a little guidance to help you find the perfect car, carry on reading for our 6 top tips you should consider when picking out your ride. Seven different modes of wedding transportation designed to turn heads! “Get me to the church on time…” may well be a well-known wedding song, but one of the principle features of most weddings is the transport to get, predominantly the bride and her party, to the wedding venue on time. 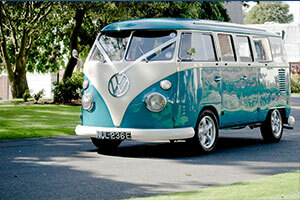 If you are planning a wedding, no doubt, booking the wedding transport will be pretty high on your ‘to do’ list. Venus Bridal, specialists in diverse and beautiful bridalwear, take a look at the different modes of wedding transportation, designed to turn heads on your big day. Read more about Seven different modes of wedding transportation designed to turn heads! Opening for its first full season in March 2017, Domes Nourz Chania offers an unforgettable location for a sophisticated and stylish destination wedding. The new adults-only hotel in Crete is the ideal location to begin your lives together - offering endless sunny days and an incredibly chic and beautiful setting. Sister hotel to the legendary Domes of Elounda, the Domes Noruz Chania, Autograph Collection is an 83 room and suites, beachfront boutique hotel. Located in a romantic seaside setting, Domes Noruz, is a contemporary lifestyle resort that combines modern Greek design with a welcoming and buzzy atmosphere – the perfect setting in which to celebrate with loved ones. Traditionally the bride arrives at the wedding marriage ceremony with her father, or the person chosen to give her away. The mother of the bride travels separately in a car with the bridesmaids to arrive about ten minutes before the bride. The groom should arrive at the place of marriage well ahead of the bridesmaids together with his best man and the grooms party including the ushers. 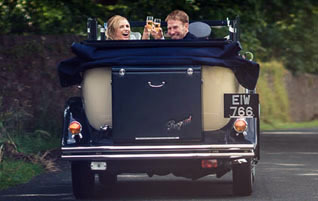 Following the marriage ceremony the bride and her new husband travel together in the brides car to the reception venue. Wedding Classics really is a family run business, as it is owned and operated by Craig and Jade, a father and daughter partnership. We have been established for 3 years but already, our reputation for offering excellent customer service at very competitive prices in the Nottinghamshire and Derbyshire area is growing. We are proud to be able to offer a choice of 6 genuine 1930's, 1940's and 1950's classic vehicles.The running gear is all authentic, the smell of original leather, the luxury and comfort of the seating, the roar of the engine and the iconic bodywork all epitimises pre and post war engineering when everything British was a byword for quality. Our cars will grace any period or modern wedding and setting. 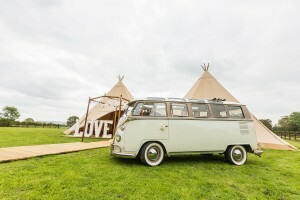 Launched in January 2014 The Lovebus Wedding Company Ltd has gone from strength to strength winning Theo Paphitis’ Small Business Sunday Award in August 2014 and have successfully reached the top 5 finalists in the transport section for the Great Northern Wedding Awards with winners to be announced in June 2015. The Lovebus Wedding Company Ltd know that your Wedding Day is one of the most important days of your life, they pride themselves in pulling out all the stops to ensure your day is filled with the magic that your dreams are made of. The Lovebus Wedding Company Ltd is the choice for people who want a chauffeur service that’s unusual, unique and exclusive. Malvern wedding cars was formed in 1998 by husband and wife team Caroline and Andrew Winstanley out of a shared passion for cars, in particular convertibles. We offer a service throughout the North west of England and the emphasis is on luxury and making the journey to the wedding venue a special event in itself. We have a stunning collection of cars that includes; an Aston Martin DB9, 1920's and 1930's style convertible cars, limousines and of course a Bentley! The cars are driven by uniformed chauffeurs who as well as being smart and professional are also excellent drivers.